Today I am excited to share the recipe for my new favorite afternoon snack. I’ve been eating this every day for the past week. Not only is it incredibly tasty, but it’s also extremely healthy, comprised of 6 “superfood” ingredients and can be made in less than 5 minutes. Start with 1/2 cup of your favorite yogurt. 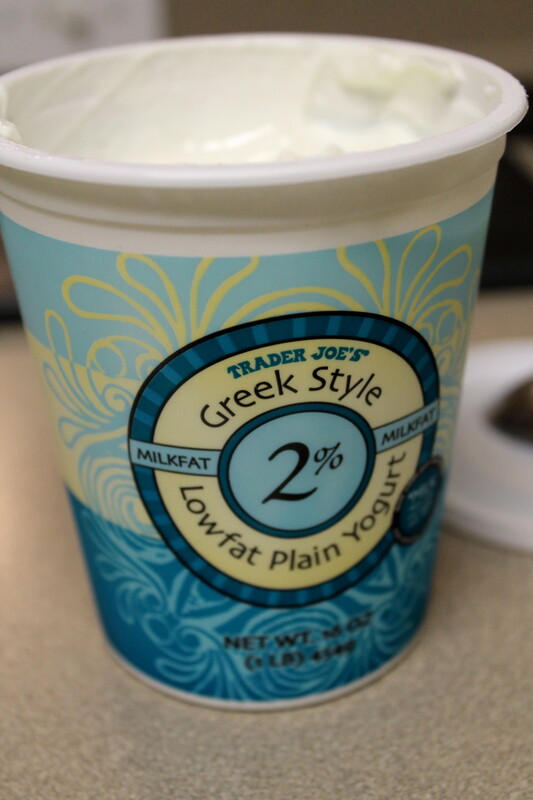 I prefer to use Greek-Style Low-Fat Plain Yogurt because its creamier and leaves me satisfied for longer than fat-free. (As a general rule of thumb, I don’t buy fat free anything and I’ve managed to stay a healthy weight through exercise and watching portion size). Health Benefits of Yogurt: High in protein, calcium, riboflavin, vitamin B6 and vitamin B12. Live active cultures are good for digestive health. Consumption of low-fat yogurt can also assist in weight loss (source). Add 2 tablespoons of your favorite granola. 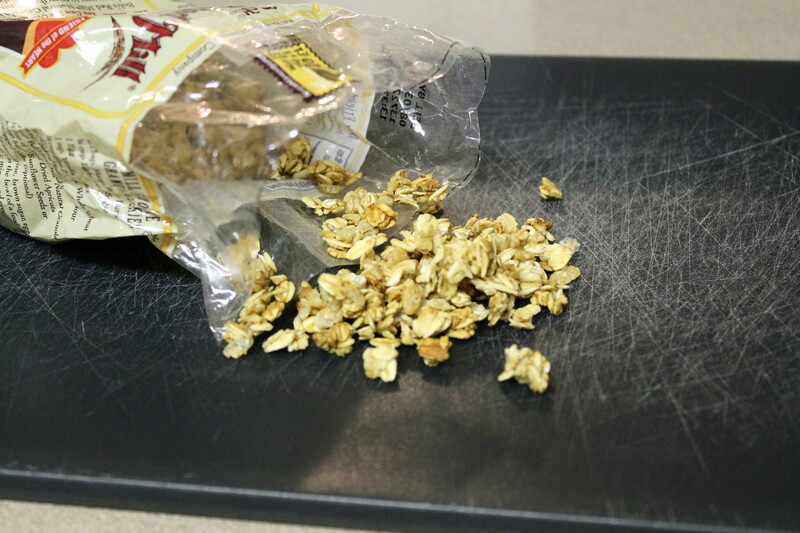 I use Bob’s Red Mill Natural Granola because it contains no added sugar or fat. Health Benefits of Whole Grains: A good source of fiber, iron and several B vitamins. May reduce the risk of diabetes, heart disease and certain types of cancers (source). 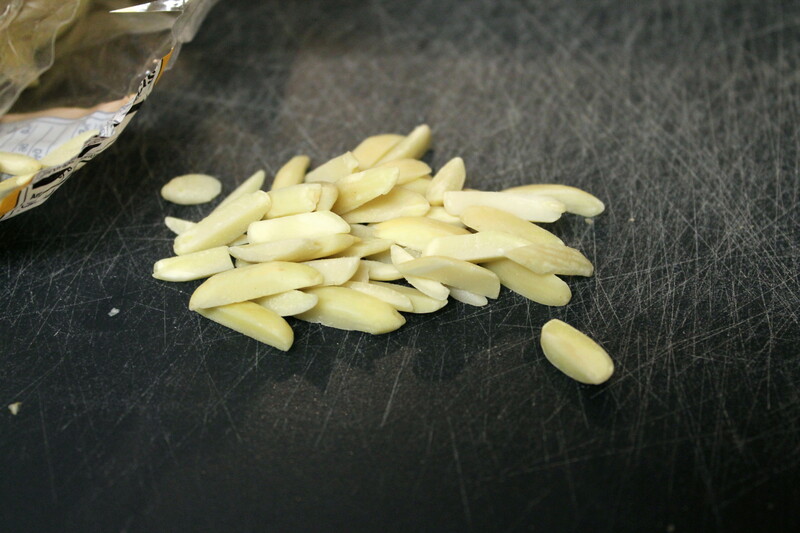 Next, add 2 tablespoons of slivered almonds. Here, I’ve used raw, blanched almonds that I bought at Trader Joe’s. Health Benefits of Almonds: High in vitamin E, protein, fiber, several B vitamins and over a dozen essential amino acids. May potentially lower LDL (bad cholesterol) while raising HDL (good cholesterol) (source). Add a generous handful of blueberries, preferably organic. 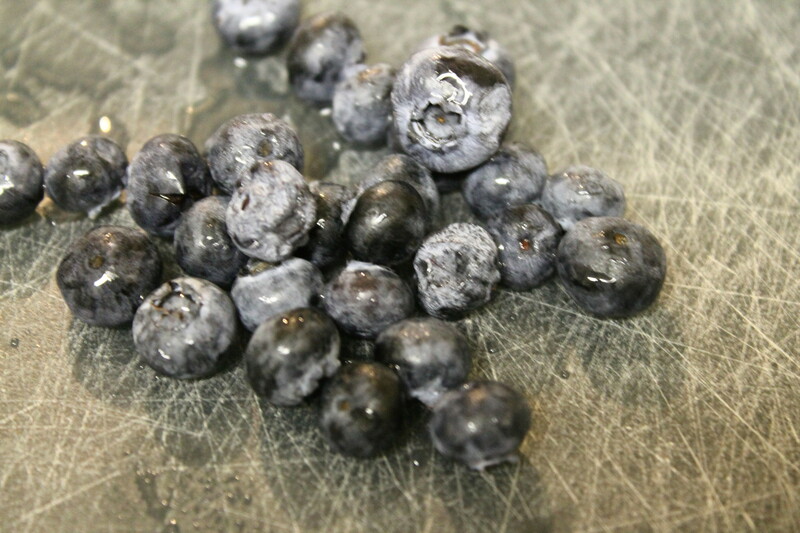 Health Benefits of Blueberries: A great source of manganese, vitamin C, vitamin K, dietary fiber and many micronutrients. Studies have linked blueberry consumption to reducing the risk of certain cancers and heart disease, lowering cholesterol and blood pressure, improving memory and reducing blood sugar and the symptoms of depression (source). Sprinkle on 1 teaspoon of chia seeds, which can be bought in most health food stores. Though initially a bit pricey, a single package will go a long way. 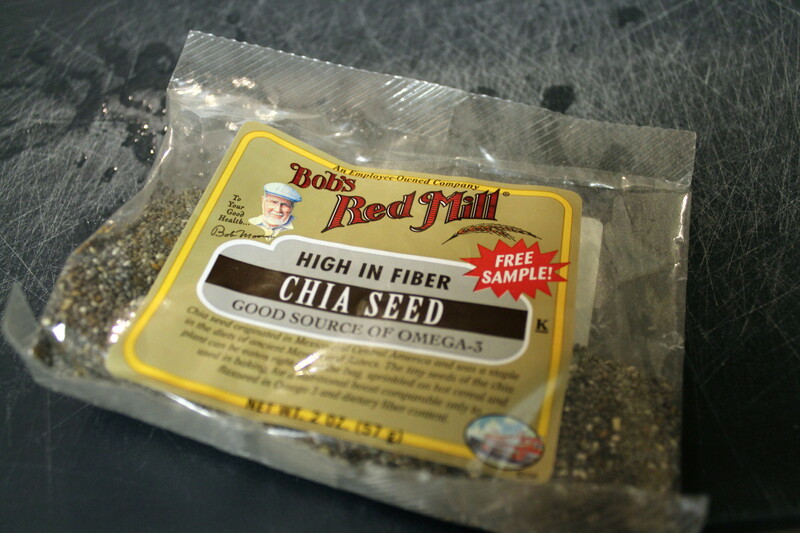 Health Benefits of Chia Seeds: High in fiber, protein, omega-3, phosphorous, manganese, calcium, potassium and sodium. May help to control insulin among diabetics, maintain a healthy colon, aid in weight loss and benefit a fetus during pregnancy (source). 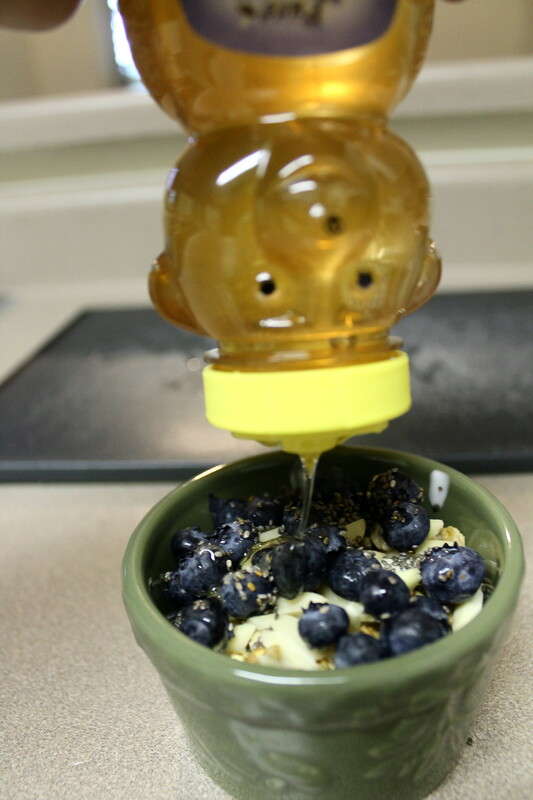 Finally, drizzle about 2 teaspoons of local, raw honey over the top. I bought the below honey bear at my local farmers’ market. Health Benefits of Honey: Local, raw honey is derived from bees near where you live, so contains trace amounts of local pollen. When I lived in Las Vegas, I used to suffer from bad allergies until someone suggested I try a teaspoon of local honey a day during allergy season to boost my immunity, and then my allergies basically disappeared. Raw honey may also be used as a digestive aid and cough suppressant (source). Enjoy with a cup of green tea for an even healthier meal or snack! 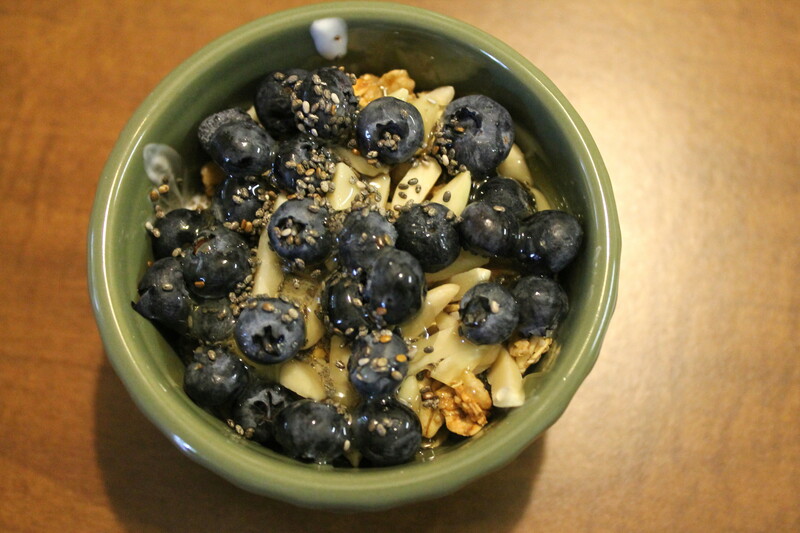 This entry was posted in Healthy Living, Recipes and tagged almonds, blueberries, Bob's Red Mill, breakfast, chia seeds, granola, healthy recipes, honey, recipes, vegetarian recipes, yogurt. Bookmark the permalink.